This is more a topic for exams, like Cisco CCIE, but also it can appear in real-world environments. 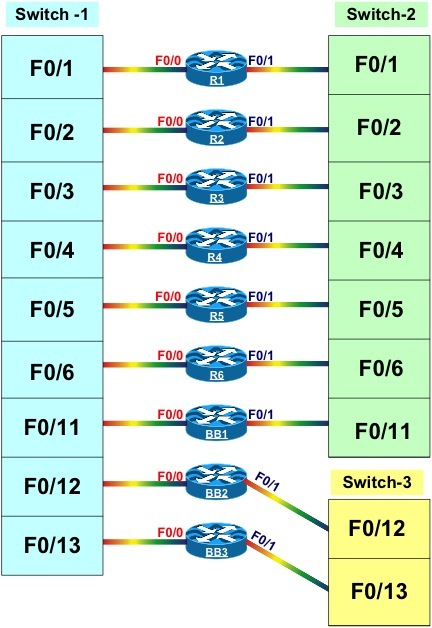 SW1 is the spanning-tree root bridge for all VLANs. Imagine that you have a request which ask you that when a port becomes active, no matter of VLAN, it should wait 10 seconds until it transition to forwarding state. Task completed. This is what I also thought. Looks pretty straight forward, but it’s a mistake which I learned from and I hope you will read this before doing it. Lucky for me it was just a test lab not the real CCIE lab, but if I don’t teach this kind of things or spend the entire day fine-tuning STP, I tend to forget. Back to this example, let’s see on the SW2 what’s happening after I did configure the above command on SW1. By the way, you need to configure this command only on the STP root bridge because the downstream devices will inherit the values. From :15 seconds when the port entered Listening state until :35 seconds when it went into Forwarding state there are 20 seconds. We were required to have 10 seconds not 20. That’s not good. OK, after reading again carefully the documentation I came to the understanding that value added to this command is applied to each state towards the forwarding state. The STP Port States are: Blocking, Listening, Learning, Forwarding and Disabled. When I did shutdown the root port, the alternate port when immediately to Listening state then waited for 10 seconds until it transition to Learning state and again 10 Seconds to achieve Forwarding state. The correct solution was obvious now to decrease the forward-time to 5 seconds. Now the total time is 10 second. I hope this will help others to avoid my mistakes. Let’s assume that I have a port open in my Cisco switch for guest users and I would like to keep track of the new mac-addresses that are added or existing mac-addresses that are removed from that port. I have a NMS (Network Management System), capable of receiving SNMP, traps that will send me an e-mail alert whenever one of the above mentioned situations happens. OK, this is a simple example, but it can be useful in some situation or for Cisco exam preparation. First let’s bring the Lo10 interface UP and configure the IP address. Please keep in mind that without a L3 interface the SNMP configuration will raise an alarm and the system will not work. SW(config-if)#snmp trap mac-notification change ? The above lines show the possible options. You can use them both if you want to receive notification for adding and removing of the mac-address or any of these options separately. I did use both for this test. I find this helpful if you have open ports which require special attention and for some reason you cannot use some technique like dot1x or lock them on static mac-address. I must say it, the preparation and exam experience, was a very pleasant one. First of all, after registration, on the Juniper website, I got access to their Learning Portal from where I could download two books in PDF format, free of charge. I already have the necessary networking fundamentals knowledge, so these two books were enough to prepare for this exam. If you are a beginner, there is another eLearning course available on the same Juniper Learning Portal called “Networking Fundamentals” which is also free of charge. I checked some chapters from this course and I was surprised how nice and clear the explanation was. Beginners can easy understand and learn the basic concepts. The theory was fine, but I wanted to have some hands on experience, so I start looking on Internet about some cheap solutions to prepare. I was lucky enough to get two boxes with Junos on them. After connecting them, I was able to start with the basic configuration and ended configuring IGP, BGP, filtering, route manipulation, etc. I also established some connections between Cisco and Juniper and configure inter-vendor routing protocols IGP and BGP. That was fun and I will add in future some “how-to” on my blog. Next, on the Juniper Learning Portal, any certification candidate can take a Pre-assessment exam. If you pass, you will get a voucher which offer you 50% discount from the exam price. A nice welcome gift! Without breaking the agreement, I think I may say that the exam was “to the point” with clear questions expecting clear answers. No room for tricky interpretations of the questions, so if you did your lessons you will pass for sure. On and on, it was a nice experience which did offer me an appreciated break from CCIE preparation. Depending on the available time, I think I will continue with JNCIS-ENT. I have to mention only one ugly point during my entire experience with this Juniper certification. Those of you who follow me on Twitter or LinkedIN already know what I’m talking about. I had to attend this exam three times and not because I failed, but because the first two times, the testing center was thinking that my time worth nothing. Long story short, 1st time they said that there is an update ongoing and they cannot held exams. After rescheduling with help of Prometric, at the time and date suggested by the testing center, I went for the 2nd attempt just to find out that the testing center was closed and they did cancel (?!) all exams without any information. Finally, 3rd time I did book with another testing center. In the past I used this testing center for Cisco certifications. As expected the things went smooth this time. I’m not blaming Juniper or Prometric for the first two experiences, but nevertheless I’m expecting at least that they will notify the testing center about this unacceptable behavior. Finally, my blog will remain mainly focused on Cisco, but I will also add some articles about Juniper / Junos in form of beginners how-to. I hope my articles will become more complex as I will gain more Juniper knowledge and my idea is to develop some scenarios which involve Cisco and Juniper mix environment. If you have questions please use the comment form, but please don’t ask questions that I cannot respond to (ex. questions from exam).